Wednesday, Dec. 29, 2010 at 9:38 a.m. It seems fitting that Chris Christie’s first year as governor wraps up with a snowstorm. That’s how it started. Before he even made his first address to the legislature back in February, the newly minted governor had to deal with a snowstorm that walloped South Jersey. He caught some flack for waiting two days to declare a state of emergency. Perhaps that’s why he decided to spend this one in the Land of Enchantment. In between the two blizzards, the past 12 months have produced numerous other political storms. That makes it the perfect time to look back at Garden State voters’ assessment of his job performance so far (as measured by polls from Monmouth University, Quinnipiac, and Fairleigh Dickinson – scroll down for the chart). Chris Christie came to office on January 13 as a blank slate to most voters. Many expressed optimism that he would be able to do something about the state’s top concern – property taxes. Just two weeks into his term, 31% approved of the job he was doing versus just 15% who disapproved, with the majority having no opinion. In other words, few voters had very strong feelings about him one way or the other. That would quickly change. On February 11 he addressed a joint session of the legislature and announced an immediate spending freeze with the words: “Today, the days of Alice in Wonderland budgeting in Trenton end.” And in what would be the first in a long line of “poster” children for public excess, he made an example of the Passaic Valley Sewerage Commission director. His job approval jumped to 52% in early March, in a sign that the public liked the new sheriff’s style. However, that early enthusiasm didn’t last when he announced his draconian budget for the following fiscal year. By the end of March, his approval rating dropped to 43% while the percentage of voters who disapproved of the governor increased to 32%. There is no question that Christie got New Jersey’s attention – 9-in-10 residents reported following the budget process – an unusually high level of public interest for a state budget. But many didn’t like what they saw, particularly the $800 million cut in school aid. By mid-April, the governor’s job approval number stayed steady at 42%, but his disapproval number climbed to 44%. Through all the budget turmoil, Governor Christie’s numbers hovered at an even positive-negative split into the early summer: This period included the high-turnout school board elections in April, where the governor took credit for the defeat of a majority of school budgets; his historic action not to re-appoint a sitting Supreme Court justice; final passage of the state budget; and the unveiling of his property tax “toolkit” plan. Considering the size of the budget cuts, the fact that Christie was able to keep his job rating “above water” was a testament to his approach to the job at hand. Voters were frustrated and he demonstrated that he understood their frustration. Still, many New Jerseyans were perplexed by the governor’s continued assault on the NJEA. Residents expressed negative opinion of teacher’s union, especially when it came to fighting the governor’s call for a wage freeze. However, they were confused as to whether Christie’s public admonishments were aimed at the union leadership – who they disliked – or individual teachers – who they held in high regard. Clearly, these battle lines were not as clear-cut as Christie would have hoped. By June, most people came to terms with the final budget, saying they could live with it as a fiscal necessity. The burning question on their mind, though, was whether the governor would now be able to turn his attention to property tax relief. The answer came on July 14, when Governor Christie signed a 2% cap on future property tax increase, the result of a compromise with Democratic leaders in the legislature. The public reacted favorably. The governor’s job approval number hit 51% in mid-August, while his disapprovals decrease to 36%. There would be a bump in the road at the end of the summer called “Race to the Top.” Most New Jerseyans said the “clerical error” which cost New Jersey $400 million in federal education funds lessened their confidence in Chris Christie’s administration. Consequently, his job rating took a hit, dropping to 44% approve and 40% disapprove. But the governor bounced back quickly, turning his – and our – attention to a set of reform agendas for the state, including a setting December 31 deadline for legislative passage of his property tax toolkit. September and October also saw the governor on the national stage being touted as a darling of the GOP and potential presidential contender in 2012. He stumped for Republican candidates across the country, including one incident where he took on a heckler on behalf of a California candidate – adding yet another clip to his popular YouTube “rant” repertoire. His job approval returned to 51% in October. But there would be rumblings of concern. These same polls revealed growing doubts that property tax relief would become a reality. 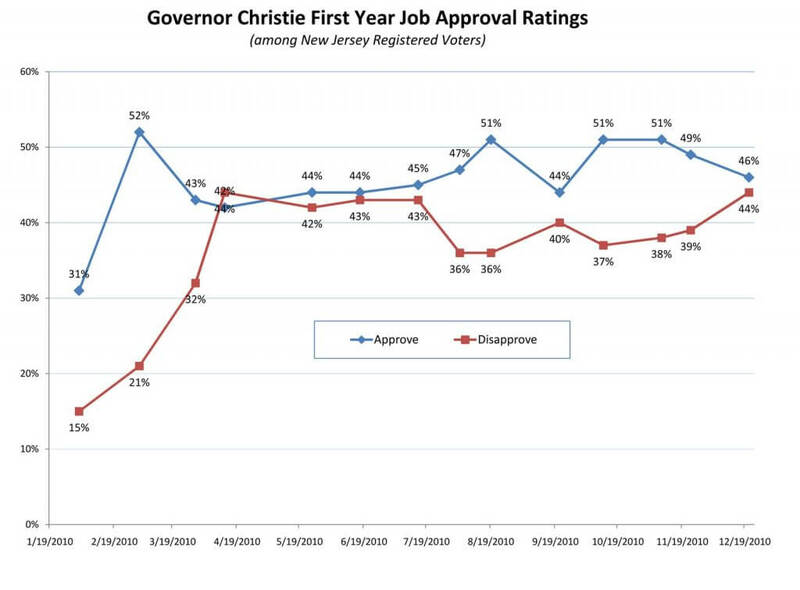 The public were also unsure of the governor’s impact on the state, with 27% saying things had become better since Christie took office, 31% saying they had become worse, and 41% saying nothing much had changed. By late November his job rating narrowed to 49% approve and 39% disapprove. And despite the passage of some of his toolkit proposals in December, Governor Christie ended the year with a 46% approve to 44% disapprove rating – basically where it stood throughout the budget process. The year’s polling indicates that a sizable number of New Jerseyans have developed strong feelings about Chris Christie – they either love him or hate him. This level of intensity is somewhat unusual for a governor in his first year. Importantly, the governor’s style, alternatively called tough or confrontational, has divided the public. While his style keeps him in the public spotlight, it will be substantive results that will get Chris Christie re-elected. The bottom line is if he has success dealing with property taxes, then his style will be viewed as having been tough but necessary. But if he doesn’t produce results, then his style will be seen as needlessly antagonistic. Governor Christie goes into his second year facing a public restless about whether their property taxes will go up and a $10 billion budget deficit. Pretty much the same scenario as last year. By most measures, he tread those waters with aplomb in Year 1. Let’s see how he does in Year 2.